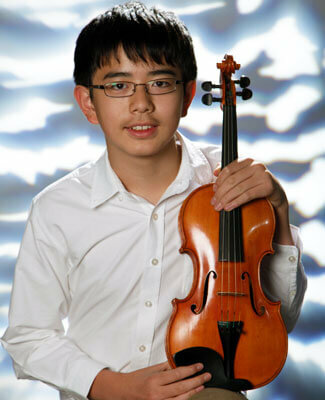 Violinist Steven Song, winner of the CSA Sinfonia 2015 Concerto Competition, joins the CSA Youth Sinfonia at 8 p.m. Wednesday, Feb. 17, to perform Violin Concerto in D Minor by Jean Sibelius. The concert inside the Boutell Memorial Concert Hall of the NIU Music Building is free and open to the public. The auditorium is accessible to all. Song, 16, is a scholarship recipient at the Music Institute of Chicago Academy program. He currently studies with Gerardo Ribeiro. Previously, he studied with Jin Zhang for 7 years. Steven has received awards from competitions such as the Geneva Granquist Music Competition, the Walgreens National Concerto Competition, the DePaul Concerto Festival and the Society of American Musicians competition. He also participated in the Fischoff National Chamber Music Competition. Song has long time been a part of the Chicago Youth Symphony Orchestra and has attended the Meadowmount School of Music on merit scholarship. He has played in masterclass for James Ehnes, William van der Sloot, Tong Wei Dong, Frank Almond, Ilya Kaler, Gudny Gudmundsdottir, Joseph Silverstein and Noah Bendix-Balgley. In addition to violin, he has studied piano for many years, appearing once on WFMT 98.7 and placing in the Steinway Piano Competition. Outside of music, Steven enjoys being with friends and playing sports. Sponsored by the NIU Community School of the Arts, and under the direction of Linc Smelser, the audition-only youth orchestra attracts some of the best high school musicians in the region. The program also includes “Russian Easter Overture” by Nikolai Rimsky-Korsakov and two pieces, “Polovtsian Dances” and “In the Steppes of Central Asia,” by Alexander Borodin.